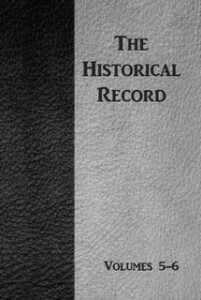 The Historical Record was published monthly by Andrew Jenson. Volumes 1-4 were only published in Denmark, but beginning with Volume 5, it was published in english. Difficult to find as originals, and even harder to read in their original state (due to the quality/condition of the paper), these reprint editions are a great addition. Volume 6 is perhaps the most popular, containing the reprinted testimonies from many of Joseph Smith’s plural wives, reinforcing the actuality of plural marriage being practiced by the Prophet in Nauvoo prior to his death. These volumes contain additional biographical information, along with statistical, historical and chronological information.